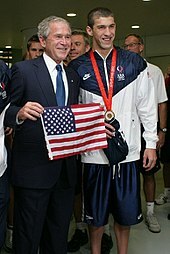 Swimmer Michael Phelps and President George W. Bush on August 10, 2008 at the National Aquatic Center in Beijing. Phelps is the most decorated Olympic athlete of all time. The history of sports in the United States shows that most sports evolved out of European practices. However, basketball, volleyball, skateboarding, and snowboarding are American inventions, some of which have become popular in other countries. Lacrosse and surfing arose from Native American and Native Hawaiian activities that predate Western contact. In Chesapeake society (that is, colonial Virginia and Maryland), sports occupied a great deal of attention at every social level, starting at the top. In England, hunting was severely restricted to landowners. In America, game was more than plentiful. Everyone—including servants and slaves—could and did hunt, so there was no social distinction to be had. In 1691, Sir Francis Nicholson, the governor of Virginia, organized competitions for the “better sort of Virginians onely who are Batchelors,” and he offered prizes “to be shot for, wrastled, played at backswords, & Run for by Horse and foott.” Horse racing was the main event. The typical farmer did not own a horse in the first place, and racing was a matter for gentlemen only, but ordinary farmers were spectators and gamblers. Selected slaves often became skilled horse trainers. Horse racing was especially important for knitting the gentry together. The race was a major public event designed to demonstrate to the world the superior social status of the gentry through expensive breeding, training, boasting and gambling, and especially winning the races themselves. Historian Timothy Breen explains that horseracing and high-stakes gambling were essential to maintaining the status of the gentry. When they publicly bet a large fraction of their wealth on their favorite horse, it told the world that competitiveness, individualism, and materialism were the core elements of gentry values. On the large slave plantations, the popular male sports were wrestling, boxing, racing, hunting, and fishing. The most popular recreations for women were dancing and singing. David Wiggins says the masters typically tolerated the slaves' pastimes as long as they were ready to work when called upon. The slave children improvised their games. Girls, for example, favored "ring dances," accompanied by songs and riddles. Horse racing remained the leading sport in the 1780-1860 era, especially in the South. It involved owners, trainers and spectators from all social classes and both races. However, religious evangelists were troubled by the gambling dimension, and democratic elements complained that it was too aristocratic, since only the rich could own very expensive competitive horses. The Civil War devastated the wealth needed to support the sport in the South. Thoroughbred racing revived in the North in the 1870s. Elite jockey clubs operated the most prestigious racetracks. They soon faced competition from profit-oriented proprietary racetracks especially in resort towns such as Saratoga Springs New York. Gambling was legal at the track, but an even larger amount was wagered off-track by unlicensed bookies, often backed by criminal syndicates. Moral opposition led by evangelical Protestants and social reformers led nearly all states to close their tracks by 1910. Much of the spectator attention shifted to automobile racing, where technology was central rather than gambling. Some tracks had both automobile and horse racing. One example was the Pennsboro Speedway, which opened for horse racing in 1887, and added automobile racing in 1926. It was the original home of the Hillbilly 100 from 1967 to 1998; the track became obsolete and closed in 2002. 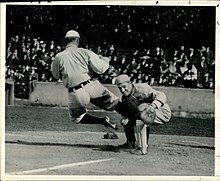 Cobb violently crashing into St. Louis Browns catcher Paul Krichell in 1912 to make him drop the ball. Organized sports played a major role in defining new models of manliness by the mid-19th century. Boxing was professionalized, and emphasized the physical and confrontational aspects of masculinity. Bare-knuckle fighting without gloves represented "the manly art" in 19th century America. Historian Steven Elliott Tripp has explored the reaction of fans to Ty Cobb, the most dominant American baseball star of the early 20th century. He was “a player fans loved to hate,” so much so that he became the pioneer sports celebrity. It was the male fans who responded enthusiastically to how Cobb demonstrated in action a new level of modern masculinity. Cobb did that by his performance as a specialist in his art, a man with iron nerve, undaunted, fighting to advance his team and his career by crushing his weaker, less-masculine opponents. Cobb demonstrated raw emotion and encouraged his audience to participate in the manly struggle underway in the stadium by shouting their taunts and jeers at the opposing team. In the early 20th century elite male and female athletes were being coached by men. Women coaches at the collegiate level developed an alternative to the highly competitive masculine model of sport in the 1920s. They created "play days" for women during which participation, cooperation, and social interaction were more the focus than victory and defeat. The motto was: ‘Play With Us, Not Against Us.’ This mode of sport also represented an effort by female administrators to obtain more control over women's athletic activity with a feminist perspective. At the sixty or so historically black colleges, such as Howard University in Washington and Fisk University in Nashville, students and alumni developed a strong interest in athletics during the 1920s and 1930s. Sports were expanding rapidly at state universities, but very few black stars were recruited there. Race newspapers hailed athletic success as a demonstration of racial progress. Black schools hired coaches, recruited and featured stellar athletes, and set up their own leagues. 1961 President John F. Kennedy throws out the first ball in opening day. During the New Deal of 1933-39, public sports facilities were upgraded and expanded with large sums of relief money. The CWA, WPA, and CCC were large nationwide relief projects that typically favored collaboration with local government, which often provided the plans and the site, as well as the materials and the heavy equipment, while the federal government provided the labor. Building new recreational facilities in public parks fit the model, and tens of thousands of recreation and sports facilities were built in both rural and urban areas. These projects had the main goal of providing jobs for the unemployed, but they also played to a widespread demand at the time for bodily fitness and the need of recreation in a healthy society. Roosevelt was a strong supporter of the recreation and sports dimension of his programs. The WPA spent $941 million on recreational facilities. including 5900 athletic fields and playgrounds, 770 swimming pools 1700 parks and 8300 recreational buildings. WPA spent an additional $229 million on sports and recreational staff workers. Eight Olympic Games have taken place in the United States. The United States has won 2,522 medals at the Summer Olympic Games, more than any other country, and 281 in the Winter Olympic Games, the second most behind Norway. 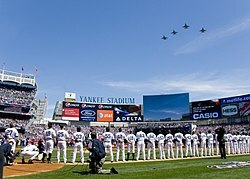 Baseball has been regarded as the national sport since the late 19th century, with Major League Baseball (MLB) being the top league, while American football is now by several measures the most popular spectator sport, with the National Football League (NFL) having the highest average attendance of any sports league in the world and a Super Bowl watched by millions globally. Basketball and ice hockey are the country's next two leading professional team sports, with the top leagues being the National Basketball Association (NBA) and the National Hockey League (NHL). These four major sports, when played professionally, each occupy a season at different, but overlapping, times of the year. College football and basketball attract large audiences. In soccer, the country hosted the 1994 FIFA World Cup, the men's national soccer team qualified to seven World Cups and the women's team has won the FIFA Women's World Cup three times; Major League Soccer is the sport's highest league in the United States. Boxing and horse racing were once the most watched individual sports, but they have been eclipsed by golf and auto racing, particularly NASCAR. Dara Grace Torres former competitive swimmer who is a twelve-time Olympic medalist and former world record-holder in three events. Torres is the first swimmer to represent the United States in five Olympic Games (1984, 1988, 1992, 2000 and 2008), and, at age 41, the oldest swimmer to earn a place on the U.S. Olympic team. ^ Carter Vaughn Findley; John Alexander Rothney (January 1, 2011). Twentieth-Century World. Cengage Learning. p. 4. ISBN 1-133-16880-9. ^ Belmont and Belcourt Biographies (September 1, 2012). Michael Phelps and Ryan Lochte: Unauthorized Biographies. Price World Publishing. pp. 8–. ISBN 978-1-61984-221-2. ^ Struna, "The Formalizing of Sport and the Formation of an Elite pp 212-16. 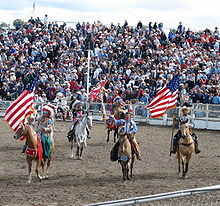 ^ Steven Riess, "The Cyclical History of Horse Racing: The USA's Oldest and (Sometimes) Most Popular Spectator Sport." International Journal of the History of Sport 31#1-2 (2014): 29-54. ^ Christopher David Thrasher, Fight Sports and American Masculinity: Salvation in Violence from 1607 to the Present (2015). ^ Elliott J. Gorn, The Manly Art: Bare-Knuckle Prize Fighting in America (1986). ^ Steven Elliott Tripp, Ty Cobb, Baseball, and American Manhood (2016) pp 256, 267. ^ Hunter M. Hampton, review of Ty Cobb, Baseball, and American Manhood by Steven Elliott Tripp, in The Journal of American Culture 41#1 (2018). ^ Lynn E. Couturier, "‘Play With Us, Not Against Us’: The Debate About Play Days in the Regulation of Women's Sport." International Journal of the History of Sport 25#4 (2008): 421-442. ^ Patrick B. Miller, "To “bring the race along rapidly”: Sport, student culture, and educational mission at historically black colleges during the interwar years." History of Education Quarterly 35#2 (1995): 111-133. ^ Patrick B. Miller and David Kenneth Wiggins, eds. Sport and the color line: Black athletes and race relations in twentieth-century America (Psychology Press, 2004). ^ John Wong, "FDR and the New Deal on Sport and Recreation." Sport History Review 29#2 (1998): 173-191 at p 181. ^ Donald S Howard, The WPA and Federal Relief Policy, (1943) pp. 127, 130. ^ Chase, Chris (February 7, 2014). "The 10 most fascinating facts about the all-time Winter Olympics medal standings". USA Today. Retrieved February 28, 2014. Loumena, Dan (February 6, 2014). "With Sochi Olympics approaching, a history of Winter Olympic medals". Los Angeles Times. Retrieved February 28, 2014. ^ Krane, David K. (October 30, 2002). "Professional Football Widens Its Lead Over Baseball as Nation's Favorite Sport". Harris Interactive. Archived from the original on July 9, 2010. Retrieved September 14, 2007. MacCambridge, Michael (2004). America's Game: The Epic Story of How Pro Football Captured a Nation. New York: Random House. ISBN 0-375-50454-0. ^ "Passion for College Football Remains Robust". National Football Foundation. March 19, 2013. Retrieved April 1, 2014. ^ Cowen, Tyler; Grier, Kevin (February 9, 2012). "What Would the End of Football Look Like?". Grantland/ESPN. Retrieved February 12, 2012. ^ "As American as Mom, Apple Pie and Football? Football continues to trump baseball as America's Favorite Sport" (PDF). Harris Interactive. January 16, 2014. Archived from the original (PDF) on March 9, 2014. Retrieved July 2, 2014. Goldstein, Warren. Playing for keeps: A history of early baseball (Cornell University Press, 2014). Hoffmann, Frank, Gerhard Falk, and Martin J. Manning. Football and American identity (Routledge, 2013). Riess, Steven. 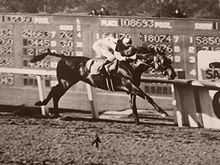 "The Cyclical History of Horse Racing: The USA's Oldest and (Sometimes) Most Popular Spectator Sport." International Journal of the History of Sport 31#1-2 (2014): 29-54. Ward, Geoffrey C., and Ken Burns. Baseball: An illustrated history (1996). 828 historic photographs of American sporting events and personalities; these are pre-1923 and out of copyright. Wikimedia Commons has media related to Sports in the United States. This page was last edited on 16 February 2019, at 18:42 (UTC).